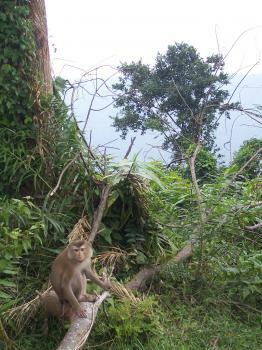 The Dong Phayayen - Khao Yai Forest Complex is known for its high number of fauna species. It is located in the mountains of northeast Thailand. The endangered or rare fauna includes: Asian Elephant, Tiger, Leopard Cat, Pileated Gibbon, Asiatic Black Bear, Malayan Sun Bear, Smooth-coated Otter and the Siamese Crocodile. 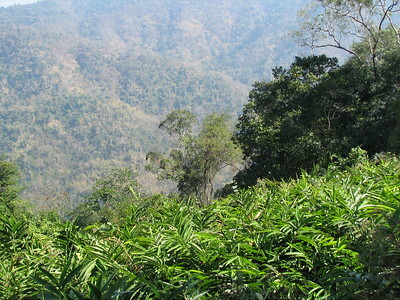 Khao Yai, established in 1962, was Thailand's first national park. It now sees some 700.000 visitors a year. Khao Yai is one of the two WHS that can be reached from Bangkok within a day trip (the other one is Ayutthaya). I hired a car with a driver for the day. From central Bangkok to the visitors center in the park it takes about 3 hours (largely spent in Bangkok's traffic jams). When you start seeing mountains and forests instead of cars and shops, you're nearly there. We entered the park from the North (Pak Chong). Here are many restaurants, hotels and resorts catering to the visitors staying overnight. After paying a 400 Baht entry fee, we could drive into the park. We were met by a group of macaques, ostentatively trying to look inside the car to see if we had something to eat. The visitor center is in the middle of the park. It has a small display about the park's history and nature. And two stuffed tigers. Outside the building a short trail starts that leads you through the forest to the small Kong Kaew Falls. It's a nice and easy walk of about 45 minutes. For more serious walking my driver left me at Pha Kluai Mai Campsite, promising to pick me up again some kilometers down the road at Haew Suwat Falls. The walking trail leading there is said to be 3 kilometers long. Although the path is quite clear, I found it rather though going because you have to climb under or over fallen trees a lot. After about two-third of the way I took a wrong turn, that directed me along/into a small creek. The birds are brilliant here; they scream ('a big white foreigner is coming') and flee to the higher tree tops. I see bright green cockatoos and ones with long blue feathers. As I cannot find any trace of a path anymore, I decide to retrace my steps. A good move, because suddenly I see where I've missed a turn. Instead of following the creek I had to cross it via two huge fallen trees (they're laid down like a bridge). The trail from there is easy again. It follows the main river. A large white (crane like) bird speeds past just above the water surface. After two hours I reach the end of the walking trail, where my driver is waiting for me. We leave Khao Yai at the south exit, passing an area with many elephants. They sometimes cross the road (warning signs tell us), but we only see their droppings. In June 2014, exactly 10 years from my first visit, I had opportunity to revisit Dong Phayayen – Khao Yai Forest Complex in Thailand, but to be more precise, only the sections of Pang Sida and Ta Phraya National Parks as a part of my company project site visit near Cambodian-Thai border. 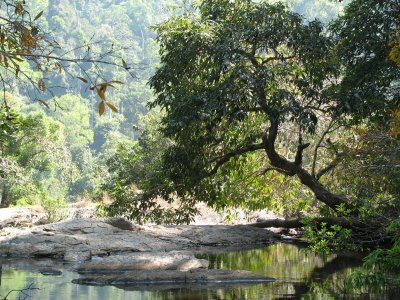 I was quite excited about the trip as a decade ago I only focused on the popular Khao Yai and Thaplan National Parks and wrongly assumed that I went to Ta Phaya National Park. The first stop was Pang Sida National Park. Our visit coincided with the butterfly viewing season, so the park was full with butterflies. The park ranger claimed that this year harsh summer causing fewer butterflies but still more than 500 species! But even less butterflies than usual, we really impressed with the park; I also saw a unique traffic sign of beware butterfly. We had picnic at Pangsida Waterfall, because of summer there was no water at all, but we were happy to eat with hundreds of butterflies around us. A few days later our group went to Ta Phaya National Park, this park is located along the border, we saw ancient Khmer Temples, but after saw Angkor, there was nothing I would want to mention. Our highlight turned out to be Lalu Park, a strange area but beautiful hoodoo landform. We could not enter the park by ourselves, our guide took us to a small village and we had to ride on farmer’s motorized cart with local guide. The ride on farmer cart was fun but bumpy. Our trip at Lalu was fantastic by its beauty and its story was very shocking and unbelievable. According to a ranger in Ta Phaya National Park and a local guide, When Thai Government declared a national park area; Lalu was already a denuded forest by illegal logging. Since there was no forest to protect and the area was a bad land for farming, both government and villagers stayed away from Lalu. When Thailand nominated Ta Phaya National Park to UNESCO, they used the official map, so technically Lalu also become World Heritage Site. Then the tourism boomed and government wanted to get the land back. There is a loophole in Thai law that if the land owner can show that if he already used the land for certain period, no need to return the land. By this loophole, villagers invaded Lalu and destroyed hoodoo to make the land farmable hoping to own the land and sell it to investor in the future, only small area is left for tourism! I am not sure that UNESCO know this problem or not, since Dong Phayayen is inscribed solely by the reason of animal and forest not the hoodoo landform, and Lalu’s status problem happened even before the inscription. Anyway I really enjoyed the less visited eastern part of Dong Phayayen – Khao Yai Forest Complex for its enchanting butterfly forest and interesting hoodoo landform, a very good World Heritage Site indeed. I only managed to visit two of the locations included in this site, Pang Sida NP and Khao Yai NP. Pang Sida I accessed from Sa Kaeo, a station on the Eastern Line while travelling from Aranyaprathet to Bangkok. A 30 minute ride by tuktuk took me to the park where I visited the falls and the park headquarters. The road through the park was closed due to the clouds of butterflies swarming over the road and creating a hazard for motorists. But stopping to see this sight was amazing, especially the wide variety of different coloured creatures. I spent three days at a small resort near Pak Chong and made several visits to various parts of the Khao Yai park. 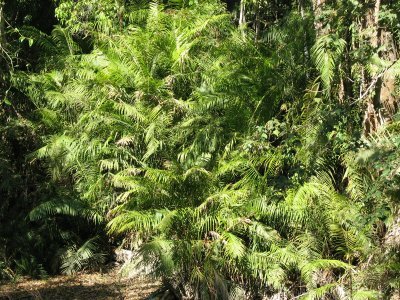 Apart from travelling the roads and visiting several waterfalls I also made two escorted forays into the jungle on foot. Here we found a wide vaiety of fauna and flora, especially numerous species of multicoloured birds. But I also encountered several types of snake, troops of macaques, clans of gibbons swinging high in the tree canopy, several species of deer. Also saw fresh elephant droppings, but failed to glimpse the animals themselves. One of the wierdest phenomena was at sundown, watching millions of bats emerge from underground caves and create huge clouds of the creatures as they set off for their nightly feeding frenzy. I wimped out a little on this one, and took an organised day trip from Bangkok's tourist enclave of Khao San Road. However I have to say the trip was pretty worthwhile, but I would have preferred to spend more time in the Park proper and perhaps got a little more chance to hike around and try to glimpse some wildlife. After some stops for general touristy things like visiting a market, we entered the park and headed straight for it's highest waterfall at Haew Narok which provided a nice glimpse of the environment. Our guide didn't seem to concerned on keeping noise down to allow a better glimpse of some wildlife, and when we did finally see a chameleon up close the other members of the group seemed a little disinterested. We then drove through the park and spotted some deer by the road side before stopping at a view point where there was a large group of macaques. I was impressed by the infrastructure of the park, I really reminded me of the national parks in US that I have visited, except the food stalls sold eminently more tasty looking food. This reflected a lot of what I found in Thailand, it is a rapidly developing country and amenities for tourists are very impressive. After we left the park we went for a meal at a 'Jungle Lodge' just outside the park proper. We then got to ride Elephants, I must admit I was not really holding out much hope of it being anything more than time filling, however I really enjoyed my brief half hour trip, and it added something extra to the day. All together this was a nice and easy trip to make from Bangkok. If I was to do it again I would certainly try and spend a little more time in the park, and especially do a more substantial hike. However what I saw of then park was impressive; and I guess that the diversity of wildlife would be very rewarding for those with a keen interest in it. We visited in July 2008 on a staff retreat with all the Lao WCS protected area staff. We were in meetings all day so just did walks 7-9am and two spotlighting trips (one in the rain). We saw lots of gibbons and hornbills and sambar deer, muntjac, civet (small indian and common palm), slow loris, otters, blue-bearded bee-eater, flying lizards, pig-tailed macaque, black giant squirrel, ground and arborial squirrel. We also walked in fresh elephant tracks and saw a large cat scratch on a sambar (probably tiger - no definite record of leopard as far as I know). If you're stopping over in Thailand it's well worth a visit. Much nicer than Bangkok! Khao Yai has many amazing species of fauna and flora, during I visited Khao Yai, I had opportunity to see famous hornbills, wild elephants, millions of bats and deer. Khao Yai also famous for its many waterfalls, the most famous is the one that was appeared in Leonardo’s film “The beach”. Khao Yai draws a lot of tourists, so this park has a lot of information for natural study as well as tourist related stuffs. In my opinion Khao Yai is a perfect example for tropical forest in Southeast Asia mainland. I also visited Thap Lan National Park which is the largest national park in this WHS; Thap Lan has a very beautiful bamboo forest and unique palm trees that Thais used these special palm leaves as paper for Buddhist texts. My guide explained how to use these palm leaves so the trip to Thap Lan is not just a natural tour but also a cultural trip. Ta Phraya National Park, the last one I visited is famous for its wild butterflies and many insects; although its quite lack of natural beauties compared to Khao Yai and Thap Lan, but it is a nice place with lots of wide flowers that attracted many beautiful butterflies. Khao Yai is very easy to visit compared to other national parks. From Bangkok, there has many buses go to Pak-Chong; a nearest town to Khao Yai, then in Pak-Chong takes a local bus to the national park entrance. As my local friends took me to Thap Lan and Ta Phraya by their car, I really don’t know how to go to these two national parks by local transportation. Location for a classic movie: Khao Yai's waterfalls Heo Narok and Haeo Suwat featured in The Beach (2000). Inscribed on a single criterion only: x. to contain the most important and significant natural habitats for in-situ conservation of biological diversity, including those containing threatened species of outstanding universal value from the point of view of science or conservation.